Lubomir (Lubosh) Kavalek (Czech: Lubomír Kaválek, born August 9, 1943) is a Czech-American world-class chess player. He was awarded both the International Master and International Grandmaster titles by FIDE in 1965. He won two Czechoslovak and three U.S. championships, and was rated among the world’s top 10 players. He was inducted into the World Chess Hall of Fame in 2001. Kavalek is also a chess coach, organizer, teacher, commentator, author and award-winning columnist. Kavalek was born in Prague, Czechoslovakia (now the Czech Republic). He studied communication and journalism at Charles University. He won the championship of Czechoslovakia in 1962 and 1968. When Soviet tanks rolled into Prague in August 1968, Kavalek was playing in the Akiba Rubinstein Memorial in Poland, in which he finished second. Kavalek, who had always hated Communism, decided to defect to the West rather than return to Soviet-dominated Czechoslovakia. He bought several crates of vodka with his winnings, used them to bribe the border guards, and drove to West Germany. "It was the biggest loss ever suffered by Czechoslovakian chess," wrote Andrew Soltis in "The 100 Best Chess Games of the 20th Century, Ranked." In 1970, on the way to the United States, Kavalek won a strong tournament in Caracas (scoring +10−1=6). He played the first half under the Czechoslovakian flag, the second half under the American flag. He represented the United States before officially setting foot in his new adopted country. Kavalek moved to Washington, D.C., studied Slavic literature at George Washington University and worked at Voice of America (1971-72). In 1973 he became a full-time chess professional. He later became a United States citizen and now lives in Reston, Virginia. Kavalek finished first in three U.S. championships. 1972 - shared first place with Samuel Reshevsky and Robert Byrne at the U.S. Championship tournament in New York; Byrne won the playoff in Chicago in 1973. 1973 - co-winner with John Grefe. 1978 - winner with a 10-4 record, a full point ahead of James Tarjan. He also finished third in Amsterdam (Petrosian and Planinc 10, Kavalek 9.5, Spassky 9) and in Manila (Larsen 12.5/15, Ljubojevic 11.5, Kavalek 11). Because of these results, Kavalek moved in 1974 to number 10 in the world on the official FIDE rating list with 2625 points. Also in 1974 he shared first place in Solingen (Kavalek, Polugaevsky 10/14, Spassky,Kurajica 8.5). 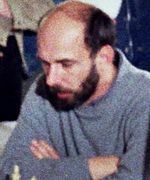 Kavalek finished third at the 1966 The Hague European Zonal (Gligorić 12.5/16, Bilek 12, Kavalek 11.5) and qualified for the 1967 Interzonal in Sousse, where he was one of the three players to draw with Bobby Fischer. In the Manila Interzonal in 1976, Kavalek finished seventh. He also qualified for the 1979 and 1987 Interzonals. Leipzig in 1965 (Pietzsch 10.5/15, Kavalek and Liberzon 10). The last GM norm. In 1979, Kavalek played in the double-round Man and his World Chess Challenge in Montreal, which he also organized. It was the most bizarre result of his career. He finished last in first half with 1.5/9, but won the second half with 6.5/9. He ended tying for seventh place overall. Kavalek played in nine Chess Olympiads, representing Czechoslovakia in 1964 and 1966 and the US from 1972 through 1986 except 1980. In his seven appearances on the US team he played top board three times and second board twice, and the team collected one gold and five bronze medals. From 1969 until 1991 Kavalek was a leading player for the German team in Solingen. During his tenure the team won 10 national championships in 1969, 1971,1972,1973,1974, 1975, 1980, 1981, 1987 and 1988 and the 1976 and 1990 European Club Championships. In the 1977-79 European Club championship, Kavalek scored 5.5/6 on the top board, including two wins over V. Smyslov. In the Nordic team vs. United States in Reykjavik in 1986, Kavalek on second board defeated Bent Larsen 1.5-0.5. In the match Moscow vs. Prague in April 1968, Kavalek beat Evgeny Vasyukov 1.5-0.5. In 1976, Kavalek was the top player on the Washington Plumbers team which won the National Chess League. In 1969 - won a 10-game match against the Dutch champion Hans Ree in Eersel, the Netherlands, with the score of 7 to 3. In 1978, Kavalek won a match against the world-class Swedish grandmaster Ulf Andersson by the impressive score of 6.5 to 3.5. The match was held in the showroom of a Volvo dealership in Washington, D.C.
Kavalek lost two matches against two of the world’s best players in Solingen, Germany. In 1970 he lost to Bent Larsen with a score 2-6 and in 1977 he was defeated by Boris Spassky 2-4. Kavalek ranked among the top 100 players in the world continuously from the end of 1962 until September 1988, peaking at number 10 in 1974, when he achieved his peak Elo rating of 2625 on the FIDE Rating list. He was again rated in the top 10 active players in 1980. By Chessmetrics ratings, he achieved his peak ranking of number 18 in early 1974 with a Chessmetrics rating of 2695. Kavalek had a notable coaching career, working with Mark Diesen, Robert Byrne, Yasser Seirawan, Eugene Torre and Robert Hübner. 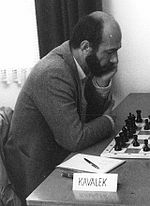 Kavalek was also one of Bobby Fischer's seconds in the World Chess Championship 1972 and served as British grandmaster Nigel Short's trainer in the 1990 Interzonal in Manila, and in Short's successful Candidates matches against British grandmaster Jonathan Speelman, Israeli grandmaster Boris Gelfand, former world champion Anatoly Karpov and Dutch grandmaster Jan Timman, leading up to Short's 1993 world championship match against Garry Kasparov. Short and Kavalek parted company shortly after the beginning of the latter match, which Kasparov won decisively. Short and Kavalek later wrote articles for chess magazines criticizing each other. Kavalek was acting captain and team analyst of the Rest of the World team against the Soviet Union in London in 1984. Kavalek was the chief organizer of the prestigious Man and his World Chess Challenge in Montreal in 1979. Serving as the Executive Director of the Grandmasters Association, he organized the first World Cup series in 1988-1989. He also organized the Prague 90 tournament in August/September 1990 under the auspices of the Czechoslovak president Václav Havel. Kavalek was selected to Gallery of Distinguished Chess Journalists in 2006 and won Chess Journalists of America awards for the best newspaper column. Between 1960-2012 Kavalek’s chess magazine articles have appeared in different print and online publications such as Chess Life & Review (1970-1979) and British Chess Magazine (1994-2010). He was editor-in-chief of chess publishing for RHM Press in New York from 1973 to 1986. He was the chess columnist for the Washington Post from 1986 to 2010, his last column running on January 4, 2010. In May 2010 he became the chess columnist for The Huffington Post. He was a member of the jury to select the best and most important games in Chess Informant (1989-1993). At the 1962 Student Olympiad in Mariánské Lázně, Czechoslovakia, the brilliancy prize was awarded to arguably the most famous game ever played at the Student Olympiads - Kavalek’s victory over the Soviet master Eduard Gufeld. It is ranked 7th in Andrew Soltis's "The 100 Best Chess Games of the 20th Century." At the 1965 Student Olympiad in Sinaia, Rumania, Kavalek won the best game prize against another Soviet player, Herman Khodos. 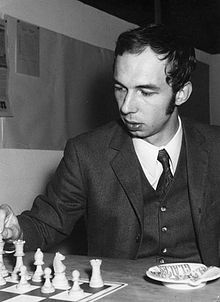 In 1975 in Wijk aan Zee, Kavalek won the Leo van Kuijk Prize for the Most Spectacular Game against Lajos Portisch. 1. e4 e5 2. Nf3 Nc6 3. Bb5 Bc5 4. c3 f5 5. d4 fxe4 6. Ng5 Bb6 7. d5 e3 8. Ne4 Qh4 9. Qf3 Nf6 10. Nxf6+ gxf6 11. dxc6 exf2+ 12. Kd1 dxc6 13. Be2 Be6 14. Qh5+ Qxh5 15. Bxh5+ Ke7 16. b3 Bd5 17. Ba3+ Ke6 18. Bg4+ f5 19. Bh3 Rhg8 20. Nd2 Bxg2 21. Bxg2 Rxg2 22. Rf1 Rd8 23. Ke2 Rxd2+ 24. Kxd2 e4 25. Bf8 f4 26. b4 Rg5 27. Bc5 Rxc5! 28. bxc5 Bxc5 Now White has two rooks for a bishop, but cannot stop the march of Black's pawns. 29. Rab1 f3 30. Rb4 Kf5 31. Rd4 Bxd4 32. cxd4 Kf4 0-1 An extraordinary final position. Black, a rook down, still has all eight of his pawns, and White is helpless against them.